Starting a blog isn’t very hard. But there’s a massive difference between having a blog that almost no one reads and having a blog that attracts an audience, generates email subscribers, and makes some serious $$$. A big part of building a successful blog is creating effective blog posts. What do you need to include in your blog posts to make them clickworthy pieces of content that rake in conversions? 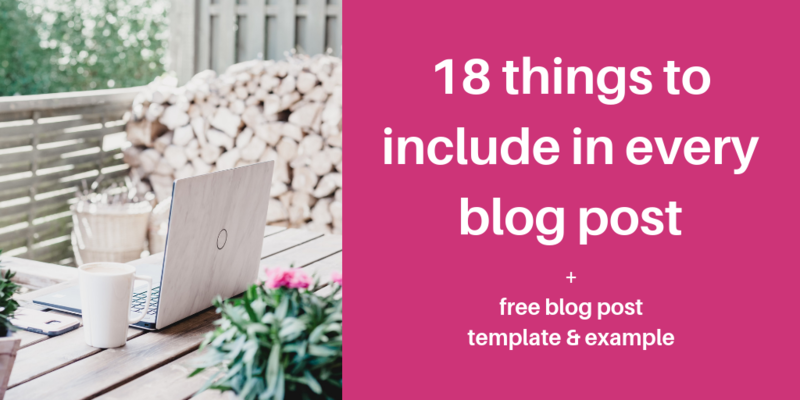 Keep reading below to discover the 18 things to include in every blog post you write. Want a blog that gives you traffic, email subscribers, clients, or customers? Learn how to craft blog posts that convert. I could argue that your blog post title is the most important part of your blog post. After all, your title is what your audience will use to decide whether to click on your post. That’s why you definitely don’t want to treat your blog post titles like afterthoughts that you slap onto the top of your posts without giving them much thought. Instead, you want to include an attention-grabbing title in every blog post you create. So what does a strong blog post title look like? It tempts your audience to click through (by highlighting a benefit or information they’d be interested in). It also contains the main keyword for your blog post, which makes your post more visible in search engines (score!). Need some help writing powerful blog post titles your audience can’t resist? Check out my post on 9 blog title generator tools that help you craft the perfect headline. Related: How to avoid common blog post title mistakes. Example: See this title on Nesha Woolery’s blog. It combines the punch of a how-to title with the power of a clear benefit. 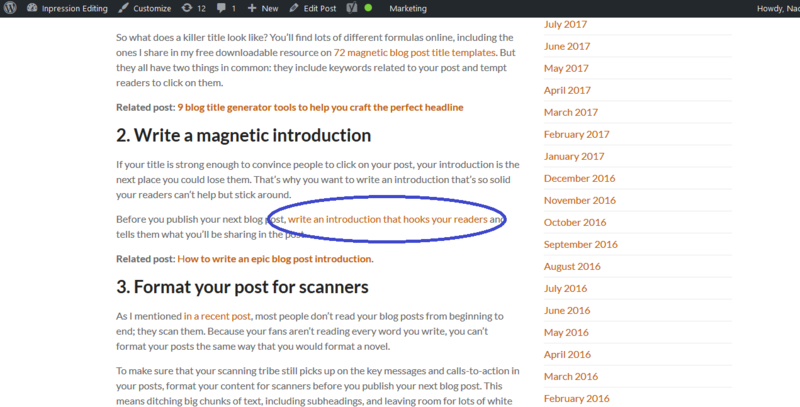 A magnetic title will get people to click on your blog post. But it won’t keep them from bouncing right after they land on your post. That’s the job of your blog post introduction. If the introduction to your blog post is mediocre, your audience may assume that your post isn’t high in quality or won’t be worth the read. But if your intro is engaging, it’ll tell your audience that your post is worth their time. And it’ll encourage them to keep reading. How do you write an interesting introduction? Attract your audience with a hook (e.g., an interesting fact or statistic). Once you’ve done that, identify the problem your post addresses and the solution or value it offers. Be sure to do this in every blog post you write for your blog. 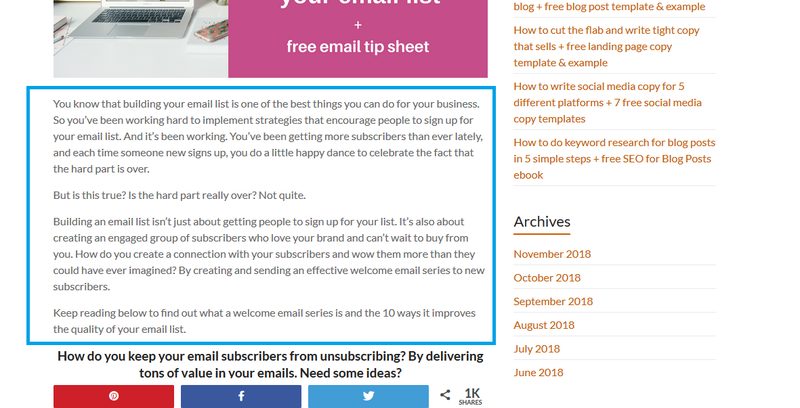 Example: Here’s the introduction of my blog post on why you should have a welcome email series. That’s why you want to use simple words and sentences in every blog post you create for your blog. It’s okay to use jargon (like “search engine optimization” and “functional magnetic resonance imaging”) when you really need to. But as much as you can, nix the 5-syllable SAT words and keep.it.simple. Example: Simple, conversational language is a staple in this blog post. How long should your blog posts be? It depends on your audience and the types of posts they’re most interested in reading. But when it comes to length, there’s something you should keep in mind no matter who your audience is: in every blog post, aim to include at least 300 words. What’s so special about 300 words? Search engines prefer posts with 300+ words. Why? Because they’re more likely to contain enough information to be useful to the people who are searching for them. Making your blog posts straightforward to read and understand isn’t just about writing them using simple copy. It’s also about writing every blog post in a format that makes it easy to navigate. How do you make your blog posts easy for your audience to navigate? Make it scannable. This involves adding subheadings throughout your post to break your copy up into sections and help your audience find specific pieces of info. It also includes keeping paragraphs short, using bullets or lists, and making use of bold and italics (but sparingly). 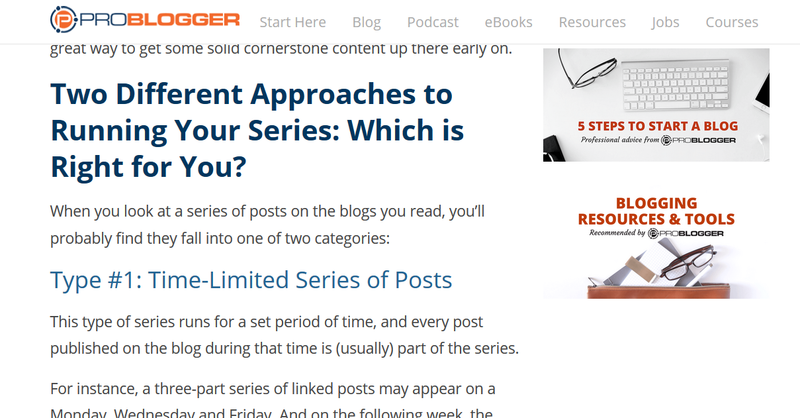 Example: The clear subheadings and short paragraphs in this post on Problogger make it scannable. Your copy may be the feature act in every blog post you write. But this doesn’t mean that your posts should only include copy. After all, blog posts that consist only of text are boring to read and tiring on the eyes. That’s why I recommend adding relevant, on-brand images or videos between paragraphs. Your visuals will help you explain key concepts, appeal to the visual learners in your tribe, and give everyone something fun to look at. Example: See how CoSchedule integrates images into this blog post. If someone visits your blog post and decides to share it on Pinterest, you can get traffic to your post from Pinterest without being on Pinterest yourself. That’s pretty darn sweet. But how do you boost the chances that someone who likes your post will share it on Pinterest? Include an image that’s optimized for Pinterest in every blog post you write. Images that are optimized for Pinterest tend to be vertical images with readable text and attractive graphics. You can learn more about pinnable images in my post on Pinterest tips that help you boost your traffic, leads, and sales. Example: Since I started using Pinterest to promote my business, I’ve been adding pinnable images to my blog posts. It’s great to have informative copy and attractive visuals in your blog posts. But if your posts are covered with copy, images, buttons, links, and ads, your audience will get overwhelmed. How do save your audience’s sanity on your blog? Be sure to include ample white space in every blog post on your blog. White space is space on a post that isn’t covered by anything else. It ensures your post isn’t too cluttered so that your audience can read without experiencing sensory overload. In every blog post you write, you’ll want to include external links. External links are links that direct your audience to other websites or blogs. But here’s the thing: including external links in your blog posts can help rather than hurt you. That’s because external links make your blog posts more valuable to your audience by directing them to additional relevant info and resources. They also boost your SEO juice. Now that’s what I call a win-win! 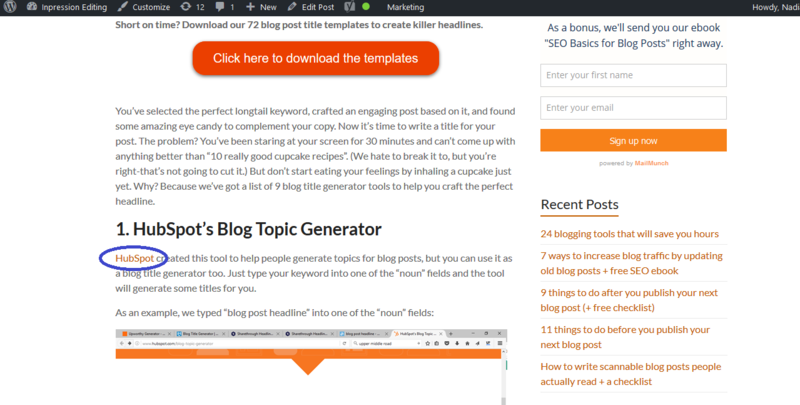 Example: In my post on 9 tools you can use to craft magnetic blog post titles, I linked to a page on HubSpot. When people add links to their blog posts, they tend to focus on adding external links. This is great. But there’s another type of link that you definitely don’t want to forget about: internal links. Internal links are links to other posts or pages on your blog. Why should you include them in every blog post? Internal links allow you to offer more value on your blog by directing your audience to additional information and resources. As a result, they keep people on your blog longer. And if that’s not enough to convince you that internal links are da bomb, I should note that internal links are awesome for SEO too. Example: In my post on 11 things to do before you publish your next blog post, I linked to my blog post on how to write killer blog post introductions. You don’t have to be the only one to promote your blog posts. Encourage your audience to get in on the fun by adding visible social sharing buttons to every blog post. This will make it easy for them to share your posts on Facebook, Twitter, LinkedIn, Pinterest, and other platforms. And it’ll help you get more eyeballs on your posts at no cost. Example: I use the Social Warfare plugin to automatically add social sharing buttons to all of my blog posts. When you get to the end of a blog post, don’t leave your audience wondering whether you forgot to finish writing it. Instead, be sure to add a clear conclusion to each and every blog post you craft. Remember to summarize your key points and highlight your take home message. You can also use your conclusion to set the stage for one of the most critical items in your blog post: your call to action (see next tip). Example: See this clear conclusion in MintSwift’s blog post. Whether you have a blog for your biz or a blog that is your biz, your goal isn’t just to get people on your blog. It also isn’t just to get people to read your posts. What do you actually want from your audience? You want them to share your post, subscribe to your email list, sign up for a workshop, buy a product, or book a service. How do you transform mere visitors to your blog into subscribers, customers, and clients? By including powerful calls to action (CTAs) in every blog post. CTAs tell people what you want them to do after reading your post. For example, do you want them to sign up for a free resource in exchange for joining your email list? Do you want them to register for a paid online workshop? Include clear CTAs in your blog posts to spell this out for your audience. Make sure your CTAs are visible, and don’t include them just at the bottom of every blog post. Depending on the length of your posts, repeat your CTA a few times in the middle of your post to give your audience more opportunities to convert. Example: Melyssa Griffin added this CTA to her blog post to direct visitors to a relevant paid product. 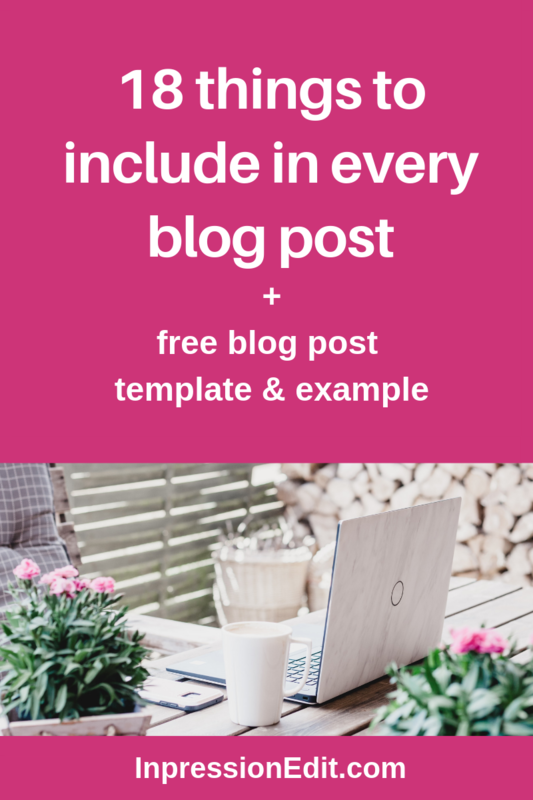 Want to use your blog to generate leads or email subscribers? Add a content upgrade to every blog post. Content upgrades are like lead magnets because they’re free resources that people can get from your blog in exchange for giving you their email address. However, whereas lead magnets are general resources that are relevant to your brand as a whole, content upgrades are tailored to the particular blog post they’re featured on. 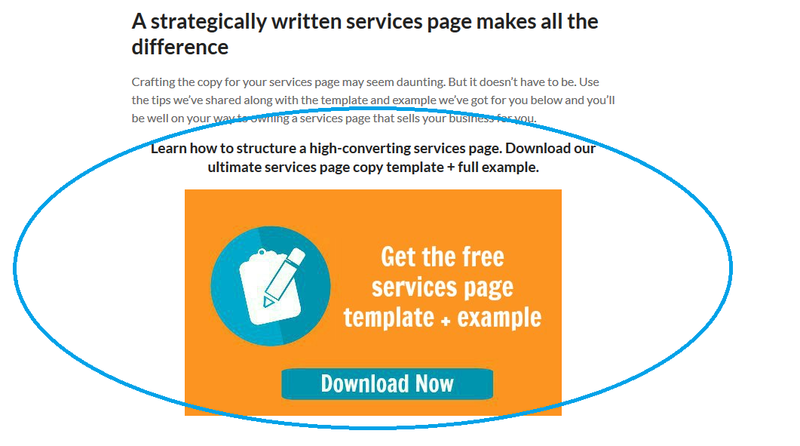 For example, on my blog post on how to write an effective services page, my content upgrade is a services page copy template. In comparison, on my post about how to write a welcome email series, my content upgrade is a welcome email series copy template. Because content upgrades help people implement the information they learned in the blog post, they’re highly valuable and useful resources. As a result, they tend to convert well. Note that if you choose to add content upgrades to your blog posts, the CTAs in your blog posts will primarily be geared at getting people to sign up for your content upgrades. Want to get more traffic on your blog from people who are interested in your niche? Build every blog post you write around a keyword phrase. In other words, make the foundation of every blog post a unique keyword. 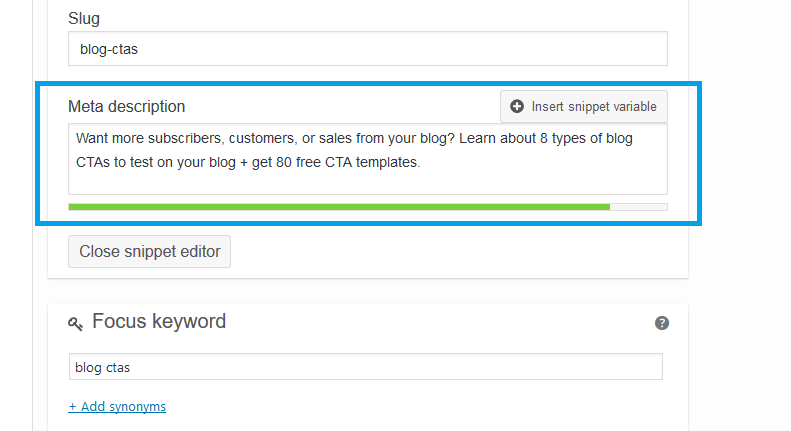 By integrating the keyword phrase “blog CTAs” throughout my blog post, I increased the chances that people will see this post when they search for “blog CTAs” in Google and other search engines. And you know what happens when more people see a blog post? You get more people who can click on it and land on your blog. Hello, traffic! Building every blog post around a keyword phrase is a good way to build up your SEO juice. But there are other simple elements you can include in your blog posts to help search engines rank your posts highly on relevant search results pages. These include optimized titles and subheadings, optimized images, and appropriate keyword densities. SEO may sound super technical, and you may not think it’s worth your time. But I’m here to tell you that you shouldn’t ignore SEO. It’s one of the best ways to create a continuous stream of targeted traffic to your blog. And because of this, it can help you grow your blog, biz, and income substantially. A meta description is a brief description of your blog post. It’s not visible on your blog post. But it tells Google and other search engines what your post is about. And if it contains the keyword phrase for your blog post, a search engine might display it as the snippet of text that shows up on a search engine results page. Because meta descriptions often get displayed on search results pages, they can play a big role in determining whether someone chooses to click on your post. That’s why it’s important to include a solid meta description in every blog post you write. You can learn more about how to write a solid meta description in my “SEO Basics for Blog Posts” ebook. Example: Here’s a look at the meta description for my post on effective types of blog CTAs to test on your blog. I know this sounds incredibly obvious. But the last thing you want is to pour your heart and soul into a blog post only to turn readers off because it contains painfully obvious typos or grammar errors. Typos and mistakes don’t just leave a bad impression on your audience. They can also make people wary about your ability to deliver a quality product or service. To ensure your blog boosts rather than undermines your credibility, proofread every blog post you write. Blogging takes a lot of work, but it can also deliver incredible results if you do it right. That’s why it’s important to make every blog post worthwhile for both your brand and your audience. To do this, include the 18 items I listed above in every blog post you write. They’ll help you craft posts that boost your traffic, increase your leads and subscribers, generate new clients and customers, and grow your income.